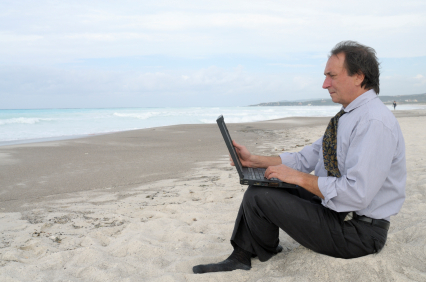 WebEx PCNow allows users to access their PC remotely from anywhere. The access is convenient and secure, and it is more than simply just a way to get at one’s files. WebEx PCNow is a full-featured remote solution that allows the user to access e-mail, programs, printing, and any other shared resources on the remote PC. All one needs to connect is Internet access and a web browser. In today’s hi-tech world, that opens up many possibilities, and it is easier than ever to connect to a PC from a mobile device. WebEx PCNow provides a particularly strong focus on the needs of the businessperson. Beyond the basic function one expects from a remote connection software solution, WebEx PCNow provides a great selection of tools for video conferencing via the Internet, remote collaboration, and incredibly sophisticated file transfer. While WebEx PCNow is a fine option for the home user, these additional tools make it a great choice for the small business that can increase productivity many different ways with a single software package. The additional productivity and potential of diminished travel expenses often translate into a great deal of savings for the business choosing WebEx PCNow. How does it compare to similar options? WebEx PCNow is not a buy-once software solution. It is a service, and the software just facilitates that service. In recent years, this has become a more prevalent means of offering remote solutions for a number of reasons. The idea of a subscription-based solution may turn-off most home users, and there are buy-once solutions that will meet their needs for quite some time. Business environments are different and ever-changing. A small business can’t afford to purchase an expensive solution that may be outdated in a year’s time. With a subscription service, the business gets the confidence that the solution is constantly evolving to meet their needs. But it is important to understand the difference between the options to get the best fit solution for your needs. WebEx.com offers a diverse range of remote PC access plans. The PCNow plan is the most popular among them, and it starts at approximately $10, which WebEx bills automatically to a credit card or other form of payment each month unless the client chooses otherwise. However, there is no commitment. Plans range as high as $49.99 per month for a single host, and there are additional savings available to the business purchasing multiple hosts. Users can access a completely free, no-strings-attached 30-day free trial. If the home user or business chooses to continue using WebEx PCNow after the free trial, everything accomplished during the trial remains. As one might expect from a service associates with Cisco, WebEx PCNow is both very reliable and extremely secure. The service-based nature of the solution allows WebEx to challenge that security and reliability every day, and to integrate any necessary changes into the solution that their clients are using automatically. This is the real power of a subscription-based solution. For the business and individual alike, having private information and sensitive data in the hands of another company is a serious risk. The client must have confidence that they are not exposing themselves to phishing scams, identity theft, or any other types of fraud. WebEx offers this level of security through 128-bit SSL encryption, and layers of additional security that WebEx.com challenges every 24-hour period. For the client who needs the utmost in protection, an opt-in phone authentication system allows no connections until the connecting user has passed this checkpoint. The client can determine to what extent WebEx demands the phone authentication. In addition, one of the great security risks in a remote solution occurs when the user makes the remote connection, but WebEx PCNow has remote screen blanking and keyboard locking mechanisms in place to protect your remote access sessions thoroughly. Support is a critical component of any software solution, but it is especially so when one is paying a monthly fee for a service. WebEx.com really shines in this regard by not outsourcing their support, and by making it available to the client 24 hours a day, 7 days a week, and 365 days a year. That around-the-clock support includes billing and general support in addition to technical support. WebEx.com has a hotline available for emergency support, and there is a ticket system, which they ask clients to use instead for non-emergency requests. Response is thorough and timely in both cases. Service-based remote connection solutions are the new trend in the industry, but WebEx.com has been here with Cisco doing it for a while now, long before it was popular. In our experience, that expertise and experience shined through in the service that they provided. That’s not to say there haven’t been hiccups, because there have been, but when issues surface, WebEx is quick to rectify them. WebEx’s pricing with PCNow is very competitive, and we haven’t come across a substantial feature offered by another solution that WebEx PCNow doesn’t match or mirror in some meaningful way. That’s saying a lot since we’ve reviewed just about every remote connection service and software package out there! At the very least, in the opinions of this reviewing team, we collectively feel it is absolutely worth your time to sign up for the 30-day free trial and see for yourself.